Stanley Yelnats’s family is dogged by bad luck; the fault of a gypsy curse put on his no-good-dirty-rotten-pig-stealing great-great-grandfather. And the curse strikes again when Stanley is found guilty of a crime he didn’t commit, and sent to a boot camp in the desert. The evil warden of the camp (who wears poisoned red nail polish – eek!) claims that digging a hole each day will turn a bad boy into a good boy. So every day, under the blazing sun, Stanley must dig a hole. Is that all there is to it – or must Stanley dig up the truth? You must have been living in a hole if you’ve not heard the hype about this book. Malorie Blackman loves it. So do we. And so will you. I thought this book was great I have read it at school as a class reader I have always wanted my own copy of the book and i have found one hear. Know we are reading the follow up book small steps, to be honest holes was way better. I have also read a few other books of louis sacher and this one is the best one yet. This book is awesome! The plot makes your brain whirr and think! I would recommend this to anyone 10+ ! I didn’t really enjoy reading this book and I found some parts quite boring. My favourite character was the Warden. I watched the movie and I found that a lot more interesting and I could actually follow the plot line. We are reading this book at school and it is awesome I love it so far. I definitely recommend it. this book was amazing a very good book to read in class. My brother said this was a really good book and so did a bunch of other people. For me it wasn’t AS great but it was alright and I didn’t understand a few parts but some I did. I would aim this at 11 and up. An amazing book, truly captures your heart. With a deep meaning, only one of Sachar’s works of art. It was fun and gave suspence and fear! It was a good book that i woukd recomend. In my opinion i believe that this is a really gripping and twisting book that once you pick up you cant put it down! This book is one of the best books I have read! The only bad thing about it, is that it doesn’t make me ask questions much. Doing this for school seemed a real bore.. but I love it!!! firstly it is an unusual style yet it works it is amazing how so many linked story lines fit together. It is also a book that leaves the reader guessing.. nothing is what it seemed!! I am 12 and love this book so does my 10- year-old brother- and my mum!!!! if you are age nine to adult you won’t be able to put it down.. believe me!!! it has a very happy ending but not for miss walker aka the warden cos she had to sell her land because despratley needed money also the land had been in the family for generations lol :) and the warden shame on her . I think that it is a great book for people to read but I don’t think that you should follow Zero’s example by going away from home with no water. NOT a good idea to follow. For experienced readers read it on your own and people that are not too great at reading I think you should get Mum or Dad too read it too you because you should read it. It is awesome! Out of 10 I would give it * ** (9). Still quit a good book well if you put it on a scale it would go of the scale it is so good! So I advice you to read it seeing that it is that good! This book was really good and I’d recommend it! It is an amazing book! there is always something happening in it! You never know what is going to happen. They all live very tough lives digging holes from 4:30am! I have read this book for about more than 6 times. This book has LOTS of twists! i recommend everyone to read this! this is a strange book but I really enjoyed reading it !! I really enjoyed reading holes and i feel sorry for two of the characters but in the end i am glad of what happened. I think that this book is brilliant but you have to be quite a mature reader to understand all the twists and shocks. The story is very cleverly-written and everything links together perfectly and a lot of thought has been put into it. I read this at school. Loved it! I really loved this book, and I liked the way Stanley’s last name was just his name spelled backwards! I am in year 6 and run a book club. I read this to the children in 1/2 and they loved it!!!!! Definitely a good book, really enjoyed reading it! It was a very exciting read which I enjoyed. I love this, Especially the yellow spotted lizard. This a amazing book. Once you open the 1st page you cant stop reading this. 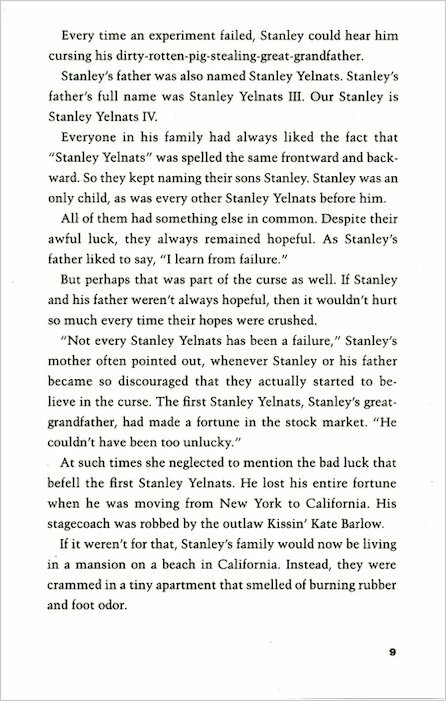 Stanley Yelnets is fro ma poor family and he has a thing going for bad luck. Thats how he was sent to camp green lake he was in the wrong place in the wrong time. He meets Zero where together they have an adventure in the desert. I would recommend all people from 10 year upwards to read this and I would give this book 5 stars. fantastic book! The film is very good to. Really interesting don’t want to let go! This book is a book that makes someone think of all the bad things they have done and the consequences they get. I would give this book 9/10 and strongly recommend it for anyone who’s looking for something a little different. It’s full of adventure and questions and had me up reading for most of the night, desperate to find out what happens. So please, please read this book! This is one of the best books ever!!! I love how there are so many layers to the story. I really enjoyed reading this book. I also enjoyed the film but the book is better as there is more description. 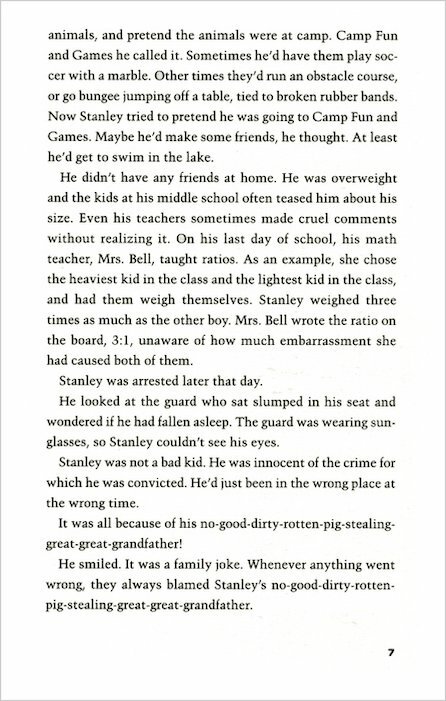 Stanley gets in trouble for something he didn’t do and gets sent to a detention camp. Is the detention camp loads of different things happen to him. Scary, moving and full of twists and turns like a roller coaster. I love it because it is easy to read over and over again. in my opinion this book is a great book to read and it is always keeping you in suspense you never know whats going to happen next i read this book in school and i couldn’t put it down i would rate this book a 5 star and would recommend this book to anyone between 7-15 year olds and i loved the film all i can say now is thank you louis sachar for writing this book. This was very captivating. Although I read this book quite a while ago, while I was still in primary, this story is a story I won’t forget. I’m so happy there is a movie for this. It just makes it more popular. This book is amazing! You go through all the emotions whilst reading it! I would definitely recommend it! Beautiful, brilliant, captivating, funny, this book will teach you morals without you realising it and also has some beautiful metaphors. Suitable for all ages – I first read it when I was quite little but I would recommend to anyone who can read! Great book Highly recommend, Louis Sachar’s one of my favourite authors! One of the best books i have read in a long time. With a gripping plot and story this book will guarantee give you 2 hours of extraordinary pleasure, no wonder they made a movie on it! This book is not for me , but it is still an amazing book because most of my freinds love it. I loved the book as it was very mystical. 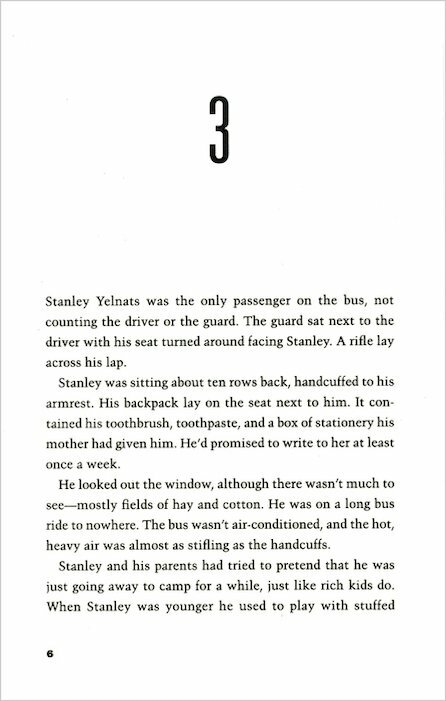 I also liked how the author made Stanley Yelnats’ name a palindrome. 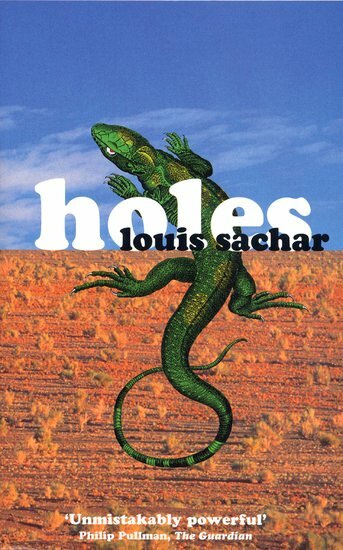 HOLES by Louis Sachar This book has a deep meaning and always has hidden suprises, page after page. It all starts when Stanley Yelnats (read Yelnats backwards!) is misunderstood and is taken away to a camp for juvenile criminals. Camp Green lakes isn’t very green and Stanley can’t see any lakes. But why does he have to dig holes – 3ft wide and 3ft deep? It doesn’t seem to make him a ‘better person’. And why is Zero so mysterious? You have to read the book to find out! This book is a perfect mix of laughs and serious text ; it kept me entertained all the way through! I would recommend it to both boys and girls age 9 – 13 and say that it was a well spent £5! I read this at school in Year 8 and thought it was a good book. 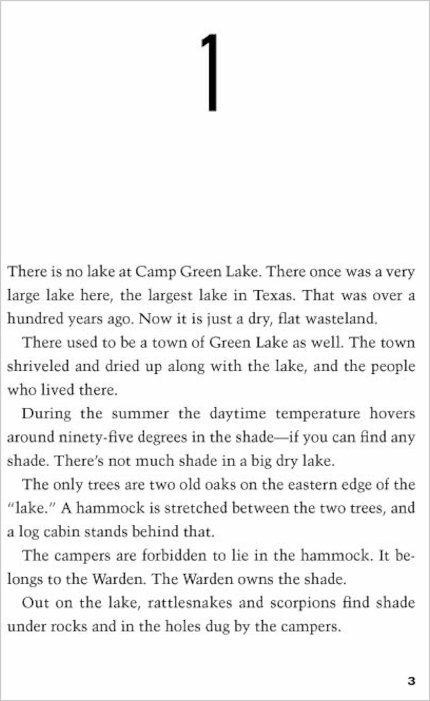 I really enjoyed the links between characters and the back story to Camp Green Lake. The movie was good too, but I think Stanley should have been played by someone larger to fit with the character description from the book. This book was amazing! My teacher read it to us in class and we also watched the movie! I loved it! Great book. Captivating and funny. I would recommend this book to anyone. In my opinion this book will make everyone engrossed in it; you simply can’t put it down! A lot better than the movie. A fun and exiting book for the whole family to read. It’s heartstopping flash backs create the craving to read on. A book everyone should read. Definately. AMAZING.love this book,teacher reads it as class reader. Its good and teaches u good words and different ways to write better. his book is awesome i started reading it in January and couldn’t stop reading (compared to the twilight saga).it relates to me a lot as i am a guide and stanley camp is completely different to my camp but we still have a bossy leaders.Its frustrating how stanley gets sent to camp green lake for stealing a pair of trainers when it actually it turns out to be someone close ( i wont give the story away).overall i think its an emotional story and whoever made this story put a lot of time and effort into it and it has an original plot. i love it. This book is slightly weird and dragged on a bit. I would only recommend this book to over 10 year olds as it’s quite hard to follow with the flashbacks and whatnot. this book is AMAZING!!! it ties up all the nots! i love it alot!!!! this is the best book in the whole world. I give this book 5 stars because,once you’ve started reading it it’s hard to put it down.if you like books about adventure then you should read this book. his book is awesome i started reading it in January and couldn’t stop reading (compared to the twilight saga).it relates to me a lot as i am a guide and stanley camp is completely different to my camp but we still have a bossy leaders.Its frustrating how stanley gets sent to camp green lake for stealing a pair of trainers when it actually it turns out to be someone close ( i wont give the story away).overall i think its an emotional story and whoever made this story put a lot of time and effort into it and it has an original plot. I really liked this book it was absolutely fantastic. one of the best books in the world I can say it is some time a tiwst but i still love it. This book is amazing and really draws you in!!!!!!! Read it and then found out we are reading it at the end of this year in school! Brilliant, reccommended to all my friends! This was a interesting book and the story line is very original. This book is like nothing I have read before, the storyline is original, and although looking back not much happens it is very gripping. I recommend giving this a go but I doubt it will be for everyone. This is a great book! I loved the plot, and I thought it was a really gripping read. Once I started reading it, I couldn’t put the book down! I think this book was totally amazing! I could read over and over again without feeling bored. It was a really exciting adventure and as I was reading it felt like I was actually there! I would recommend this book to all my friends and family! reading it in school it actually takes you to texas. recomend to everyone who likes reading! I think this book was very interesting and had great detail. It was a brilliant read and better every time . i really enjoyed reading this book. it got me hooked on the first page. I don’t like this book as it is very random and not linking!! I liked this book. The plot is really fascinating and exciting. The characters are great. I recommend it! I had to read this in English at school to do a project on it, and it’s a really good, powerful book. 5/5! Not the best,not the worst. it was a great read!!!!!!! LOOKS LIKE THE WORST BOOK EVVVVVVVVVVVEEEEEEEEEEEEERRRRRRRRRR!!!!!!!!!!!!! I read this book in my english class as our chosen project topic it was a great book couldnt put it down. I read this book at school with the class and i LOVED it, its AMAZING! I did not expect to like this book from the summary on the back – but I found it really facinating – it raised lots of issues – and because Stanley is such a loveable person – you really want to fight his cause. The ending was humerous and funny too. I would recommend it. It was our class book in year 7, but good readers aged maybe 8+ would be able to enjoy it too. I read this book with my class at school. And we absolutely loved it and so do I! I think at the end how everything came together was awesome! I recommend it for anyone over 8 years old. I thought this was a very smart book, with a secondary plot interlinking into the end of the main plot left alot to your imagination. The book kept me interested throughout the entirity, it was a very thrilling book, I loved trying to figure out mysteries in the plot. this book had a great idea, but there were some boring bits and it had a slow start. if it werent for that, I’d give it 5 stars! i think this book (HOLES)is good because this boy called Stanley yelnats goes on a bus , but it’s not a ordinary bus it is a bus for the norty children , but he did not no that he thought it was a school bus because he had never been to school , so he went on and then the bus went and 1hr later the bus turned up and then he went to the boss called Mr sir who always carried a bag of sunflower seeds after a wile Mr sir gave Stanly a orange set of clothing to put on and his cot even though he was not a baby had to sleep in a cot that smelled like sour milk then like 2 weeks after he met with some other people 1 was called i caveman i’m not sure if it was caveman , but 1 of the children could not read or right and on that day the woman in charge called stanly over because mr sirs seed had gone missing and everyone blamed it on stanly then the woman who is in charged put nail varnish , but it was posiners then she scrached Mr Sir across the face because the woman found out that Mr Sir was lying because they found out that it wasn’t stanly , so then for about 5 weeks Mr Sir pretended to fill his canteen. We read this book at school and it was really interesting. It has a brilliant story line and is much much better than the flim of it! This Book was amazing. I would recommend it to anyone because this book is something that everyone will enjoy. We started reading it in class and when I first saw the cover and the blurb, I thought the book was a bit boring and not for me. But once I got into it, it was really good and I got excited for every english lesson, which is a big thing for me! I won’t say too much about the plot because I don’t want to spoil it for you. But all I will say is that you have to buy it. I think that £6.99 is a great price for such a great book. this book is a funny but believable story with all the wonderful characters to explore. thank louis sachar for writing this book it has been a pleasure studying it a my middle school. This is a really good book. The contrast between the past and present makes the book even more good. The adventure is amazing and the way everything adds up is fab. It’s realy afantrus,fun and cool! My teacher is reading this book to our class and so far it is awesome!Stanley and Zero are heading back down the mountain.In my opinion this book is a must read because it`s got everything you need for a great book suspense, surprise,adventure and a adventurous dilemma. I loved this book so much I decided to read the sequel, but when I did I wasn’t impressed but it did not make the first one any less good if that makes sense! Holes was amazing. I especially loved the part when Stanley left to go and get Zero. It had an amazing storyline and as the story progressed, the more I became hooked on the book. It really was a great book and I would recommend it to any older readers because it is for everyone. it was absolutely brilliant, the story is so clever because all the little pieces of detail fit together. An amazing story and a great read. Loved it. If you are looking for a bit of a “non Linking book” this is for you!! It is quite strange!! Stanley has to go to a camp for bad boys because he apprantly stole clives sneakers. In the camp they have to dig holes… why?? .. Will he escape… you can find out?? It is quite a funny story!! I loved this book and even though I not much of a reader, I still found it impossible to put it down. This book inspired me to do more reading and ever since I’ve loved all the books that Louis Sachar writes. To sum up this book in the least words possible then I would say that it’s a pageturner and one of the best books that I’ve ever read. I would reccomend this book to everybody that I know. Probably the best book I have ever read! I thought this book was absolutely amaziing! i have read it numerous times because i so thouroughly enjoyed it. It is about a boy who steals an athletes trainers and gets sent to a camp where all he has to do is work and dig holes in the ground. You’ll have to read more to find out but i would definatly reccomend this book for readers over 10 years old! I think this book is graet!! I quite liked it but not something I would read again. i love this book because it is all about treasure and believing in yourself and i think its a fantastic book and everyone should read it!!!! I think the book ‘Holes’ was very intresting and exciting.It is a page turning adventure. I loved this – even the main character’s name is funny. It really grips you as when you start reading you have no idea what they are digging for either. Then when they escape you are rooting for them to be safe and to successfully evade their pursuers. A very good book with lots of twists and surprises! I love it I totally loved this book because it makes you reealize Stanley’s feelings and be happy that you didn’t have such fate. it was amazing especially the part when the rain comes down! is a must read everybody has read this book because it is amazing !! 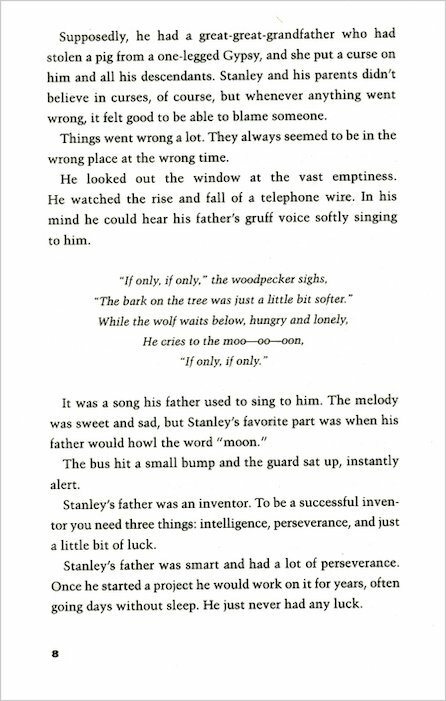 I totally loved this book because it makes you reealize Stanley’s feelings and be happy that you didn’t have such fate. Amazing book. It took my breath away – I am a girl, and wouldn’t expect to like this book but it is AMAZING. The author’s choice of vocabulary is perfect, and I GOT GRIPPED!!!!! I loved every minute of it, and found myself awake at night, wanting to finish it – the words came alive on the page and the characters were fabulously written and described. UNMISSABLE! this book is really good and i would reccomend to anybody boys or girls even my mum liked it! its about a boy who gets sent to camp instead of jail; and when he is there he makes friends and has a big adventure. Holes is a strange powerful tale. I could not put the book down, but yet the story confused me a little! A book not to be missed. It was quite good but sometimes confusing. it was a thrilling book a really enjoyed it!! Oh my days, I actually LOVE this book! It is sooooooooo good! I could read it over and over again. It’s so poignant and witty- deffo 5 stars. Read it ASAP! it was good but not as good as other books! I Love this but it is so amazing and wicked as well as good! This book was a fantastic read. The story line is unique and exciting. I think that the characters all had different personalities, this made the book even better. I could not put it down during class! It’s a must read! Wonderful! I watched the Film , it’s about a boy who is sent off to boot-camp then he finds a lot of money and becomes famous. The main character is from ‘Even Stevens’ in the film it’s a good film I love it! i kinda liked the book i mean, it gets boring really quickly but then start getting good again i give it 3 gold stars. Absolutely marvellous! I don’t know why, but I felt as if I was Stanley, and I hoped for the best for him. When that didn’t happen, I just had to read further to find out what happened! AMAZING!!!!! just finished reading it in class and my teacher couldnt get me to stop reading because it was so great!!! Weak links make me lose interest, although it does have some good parts! In my english lesson I learned it I enjoyed it it was a little scary but it was a very good book. This book is AMAZING! A must have for people who like funny books, mystery books and a twisty story line. I am not saying ANYTHING about Holes! You just have to read it yourself… Oh – there’s also a sequel – but Holes is better than it! Remember… Read the books before the movie! I read it in school and loved it! Don’t like the film much though. I thought this book was truly amazing. 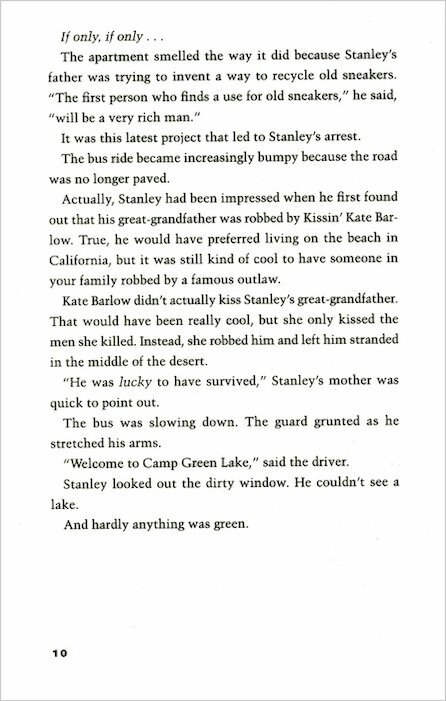 I really felt for stanley at camp greenlake when he had to dig all those holes :( I also like the fact that stanley’s surname is stanley spelt backwards. This book is amazing and it is for explorers and readers who would never say no to an adventure. It is full of love and hatred and adventure, friends and happiness. Join Stanley ‘Caveman’ Yelnats and Hector ‘Zero’ Zeroni for an adventure you will never forget! 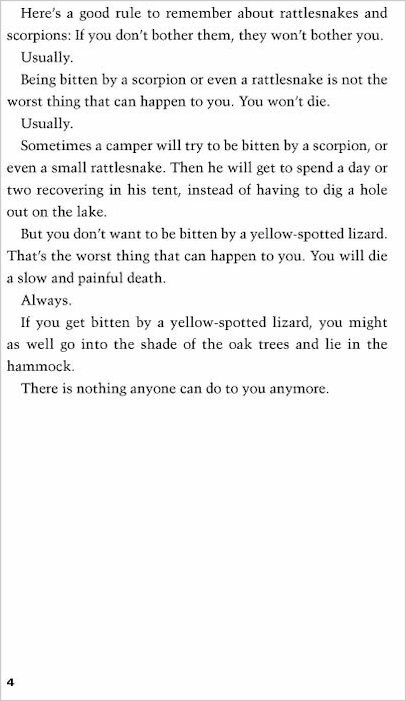 Holes is a brilliant book about a boy, Stanley, who gets sent to camp. However, when he gets there not all is as it should be. Why are the children digging Holes? What what are they trying to find?! i have read this book and i found it hard to read at the start but then i just could not put it down. reccomended!!! I read this book at school with my classmates. The book is OK but not for me. It uses a good range of description and words but maybe for someone that likes ALOT of adventure!!! I loved it. Amazing book written by an amazing author. The beginning is not straight forward but when you start reading the book, it’s amazing. Also the in the book everything has a history. Some-times you don’t undertsand what’s going on but when it explains it becomes water clear _ I would recommend this book to people who just want to read something good. My friend has read this and she thought it was going to be boring but found out it was quite cool! This book is a mixture of a adventure and mystery and has a different perspective on life. This is one of the book’s on my ‘brilliant book’ list. It’s funny, heartbreaking and on-the-edge-of-your-seat book all rolled in one. It’s DEFINITELY a 5 star book. It takes a while to get into it but gets really exciting!!! I love it, our teacher read it to us in class, really interesting…......................................................... I am reading the Next one which is called Small Steps I would defenatley read this book. I saw that this book had only four stars and I was quite shocked. I loved this book to bits and when the movie came out I loved it, (if possible) even more! This book, jump started Shia LaBeouf’s career! And I can understand why! Two teenagers, joined with fate, embark on a journey that changed their entire lives. Without giving too much away, the play on the the main characters name got me hitting my head against the wall! Holes is a well strucktured book that is so additive, it left my class constenly reading it.It has an equell balance of of flash backs and present time and in the end, all makes sence. It is mixed with exsitement, sadness, funny,realization and gladness. My favourite book yet! Hi. This book is amazing I just love it. If you have read this you probably know what I’m going on about. I would recomend this book to eceryone. Its a great story! Also, a good plot. Loved it! If you read it over again its just better than you thought it was in the beginning!!! IT IS REALLY INTRESTING AS I HAVE READ IT . IT INSPIRES YOU MORE TO READ IT . I’ve read this book and I realy enjoyed it and as soon as I put it down I picked it back up again. loved it it was moving and exciting and i really enjoyed it!!!!!!!! wish i culd reed it agen!!!!!!!!!!!! I’v read better books!!! ;( for 8-11 yrs v age!!!! In Broadfields school we’ve read this book and even watched the film and we really loved it. i studied this boor 7 and it was so exciting i couldnt wait to read more it leaves you on a cliffhanger and you wont put the book down, if you want to read this order it and read the adventure stanley yelnats have because it is very funny aswell as exsploring. REALLY good book! Read it if you haven´t. Holes is an amazing book and will keep you gripped and entertained. I thourghly recomend it. it is a really good i loved it.one of my favourite books!! Holes is a really well written book. It is all about a boy called Stanley who has supposedly commited a crime and is sent to a sort of camp to reform him. He has to dig holes every day. Alongside this side of the tale is the tale of one of his long dead relations and as the story unfolds the two mysteriously link together… I LOVED this book and would suggest it to boys and girls aged 8-15. I read this book as a project at school, and at first sight, I thought “Wow, this book looks so boring!” As I started reading this book I realised I was (quite literally) judging a book by its cover! When I was about a quarter into it, I saw that the book was excellent!! It is so well written and is definitely a book which should be read! It is really quite amazing as it is a story about friendship and can show you quite a lot about friendship! READ THIS BOOK! I read this book and I thought it was great. It is a perfect story about a boy who gets sent to this camp…probably worse than jail. Camp Green Lake. Theres not even a lake! Its barron and dry. It is a breath-taking adventure. I LOVE this book. Louis Sachar put this realistic story together very well. It’s not a true story, though. I LOVE THIS BOOK AND THE VIDEO IT WAS AMAZING I READ THIS BOOK IN SCHOOL AND IT WAS THE BEST. I love this book. I had to read it for school and everyonr should own a copy! this book failed to captivate my attention the storyline was ok but the style of waiting just wasn’t for me. I am in the process of reading this book, and already I am being sucked right into it, as if I am Stanley Yelnats. It is a really great book, for what I have read anyway! This book is very good and makes you feel all different emotions. At the beginning it is quite hard to understand but as you get further into it it all becomes clearer. 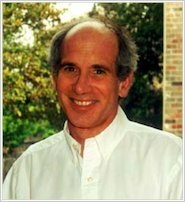 Louis Sachar is a good author and always makes a funny side to hi books. I have read many of them, like ‘There’s a boy in the girls bathroom’ and ‘Sideways stories fro Wayside place.” That has been turned into a TV program. I would give this book * (5 stars) as it is very funny but also realistic. I recommend this book to all people who enjoy reading, girl/boy. utterly rubbish.probably the most boring book known 2 man. hard 2 tell bcoz small steps is just as bad. Resently my class read the book and watched the movie. I loved the book. I liked how the book went back in time. very cool! i couldnt stop reading it! this book is not for me i think its rubbish if i had to give it marks out of 100 it would be 1. Holes is great book for older readers. I am 12, and it is one of the best books i have ever read. Without giving to much away, it’s about a boy that is sent to live on a boot camp type thing. All the boys there are forced to dig holes in the hot desert sun all day. It is a book about friendship, Fear and sticking together, no matter what. I have also seen the film which is eaqually good, and also explains the book more. All in all, this book is a must have for all children 10+, any age under that, I would advise the film for if you are desperate to know what it’s about. Having read Louis Sacher before, I knew this would be a good book. Little did I know that I would be sucked in to Holes, I felt as if I was Stanley and was suffering with him. I was a brilliant book that kept me hooked till the end! I’m not sure about this book. I started reading it but I stopped because it was long and it went on. It just kept going on about how he got theare and droned onn to much. My freind has read this book and he says it is a good book. It was so brilliant, I couldn’t have liked it more. this book is an amazing thriller with surprises around every corner i would definatly read it again. i would relate this took to a jig saw puzzle as all the pieces matched together at the end. and all i can say is that louis sachar is very intelegent to have thought of such good ideas to be put into this book.